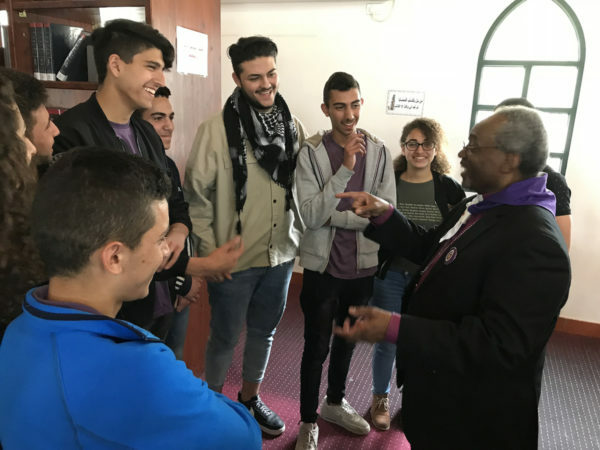 [Episcopal News Service – Bethlehem and Nazareth] The gift of spending Holy Week in the Holy Land grew deeper and more real on March 28 for those on pilgrimage with Presiding Bishop Michael Curry. 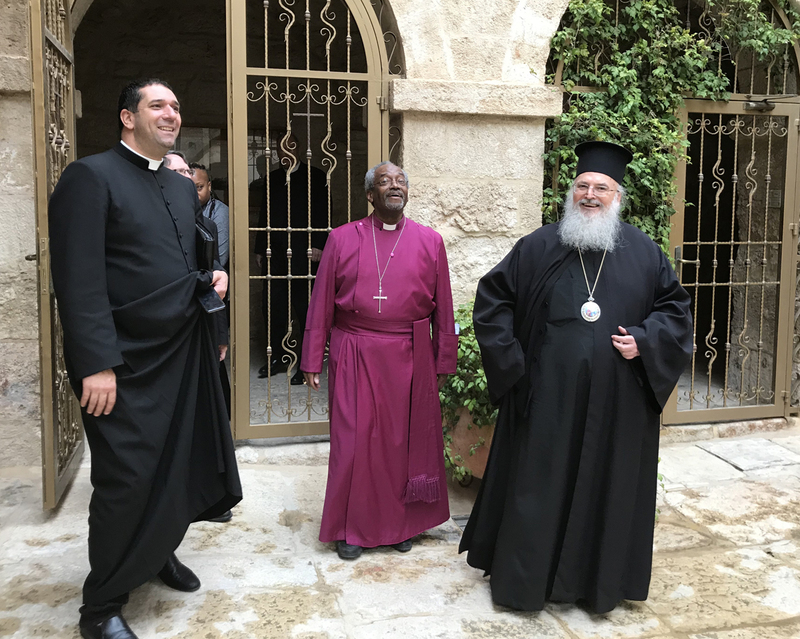 In a small sample of the ecumenical hospitality that the Episcopal Diocese of Jerusalem both enjoys and offers, Curry and those traveling with him were the guests in Bethlehem of Greek Orthodox Archbishop of Jordan and Patriarchal Commissioner to Bethlehem Theophylaktos. The group traveled there at his invitation to hold Morning Prayer in St. George’s Chapel at the Church of the Nativity and meet with him. He also welcomed them to pray in the Grotto of the Nativity below the church, which is undergoing extensive renovation and conservation. Theophylaktos later offered the group sweets, short glasses of brandy and small cups of Arabic coffee during the early-morning conversation in his office in the newer 250-year-old wing of the Church of the Nativity. The older part of the church is 500 years old. His office walls were lined with religious icons, as well as an icon symbolizing the 2 million pilgrims who annually visit the church: a flat-screen TV with nine camera views of the shrine. Five church groups had arrived at 5 a.m. that morning to tour the church. “It is a joy to be with you and to meet you,” Curry told Theophylaktos. “And I bring you greetings from your brothers and sisters in the Episcopal Church. We pray the blessings of the crucified and risen Lord on your ministry. Curry addressed political realities in the United States, saying “our country is very troubled right now. Young people at Christ School, a ministry of Christ Church, the Anglican parish in Nazareth, later in the day spoke to the group about their efforts to make peace among Muslim, Jewish and Christian young people. To that end, Jerusalem Peacebuilders, which has roots in the diocese, promotes what it calls “transformational, person-to-person encounters among the young people of Jerusalem, the United States and the Holy Land.” Moreover, it provides them with the opportunities, relationships and skills to become future leaders for peace in the global community. Jerusalem Peacebuilders also oversees three youth leadership programs in New Haven, Connecticut; Houston, Texas; and Brattleboro, Vermont. Each camp runs two weeks and includes leadership skills, dialogues, guest speakers and a faith-based component. Participants who complete all three years become counselors in the programs to further strengthen and develop their leadership and peace-building knowledge and skills. The United Thank Offering recently gave the group’s regional director, Jack Karn, a 2018 Young Adult Grant of $2,500 to help fund new in-school leadership and peace-building programs in the Galilee area of the Holy Land where Nazareth is located. Karn is from the Diocese of Vermont. One young Palestinian Arab student told the group that he joined the organization because, as a Muslim, he wanted to build peace. “I want my country to be back. I want Palestine and I want a solution to all the violence,” Yousef Hassan said. A Christian student, Ghenwa Abu Ahmad, said the camp experience taught her to see herself in others. “You see how similar you are, despite our differences in appearances or religion,” she said. 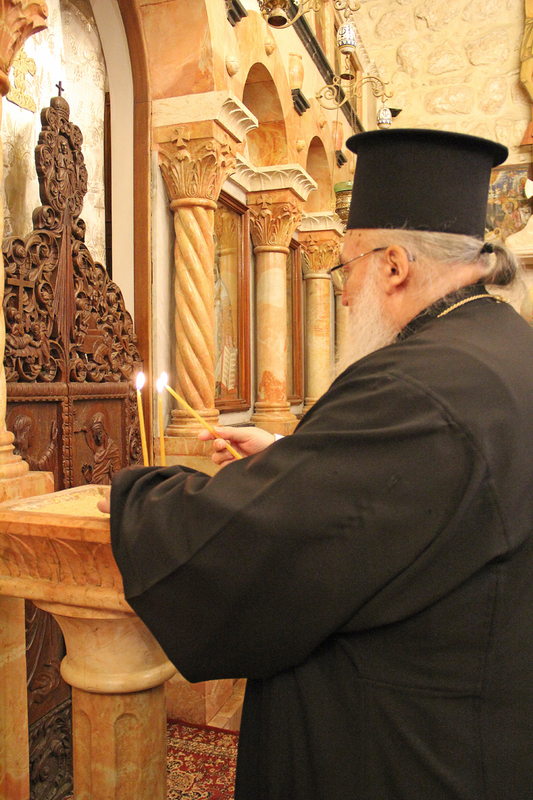 At the Church of the Nativity, Theophylaktos spoke of the peaceful relationship between his church and Anglicans, which is long-standing. While the Very Rev. Hosam Naoum, dean of Anglican Cathedral Church of St. George the Martyr in Jerusalem, translated for the archbishop, Theophylaktos used English to emphasize his point. “We have a special love for Anglicans,” Theophylaktos said in English. The dean explained that, when Anglicans arrived in the Holy Land in the 1840s, they acknowledged the Greek Orthodox patriarch. To this day, the Anglican religious leader of Jerusalem is referred to as the “Anglican archbishop in Jerusalem” instead of the “Anglican archbishop of Jerusalem,” in deference to the Greek Orthodox leader, Naoum said. When a new Anglican archbishop is enthroned, the patriarch participates in the service to bless him. Those ecumenical relations extend to the Armenian Orthodox as well, especially during their Holy Week, which this year begins on April 1, the western church’s date for Easter. Naoum said the Armenians consider Maundy Thursday to be the climax of Holy Week. As symbol of the relationship, the Armenian leaders invite the Anglican archbishop, currently the Most Rev. Suheil Dawani, to their liturgy that day, vesting him as an Armenian bishop and having him proclaim the Gospel. During the western church’s Holy Week, the Armenians give Anglicans access to the Abraham Chapel in Jerusalem’s Church of the Holy Sepulchre for an afternoon Eucharist. That liturgy is not possible this Holy Week because the chapel is part of the church’s extensive renovation project. The church in the Old City enshrines Calvary and the empty tomb. Later at the Church of the Annunciation in Nazareth, Franciscan priest Peter Hughes made the same point as he explained the centuries of ruins that were uncovered as the current church was built in the 1960s, a continuation of centuries of enshrining the grotto where the Archangel Gabriel appeared to Mary. The excavations have yielded parts of a first-century building in which some members of what was then a sect of Christ-following Jews worshipped, a later basilica and the church built by the Crusaders. Naoum said, “The challenge is how much we can keep that sacred” so that the week’s liturgies and other events remain acts of worship rather than performance. “It is a gift and we need to keep it holy,” he added. Still, religious tourism is part of the Holy Land economy, and at Christ School, the group heard from two 10th graders, Sham Abuliel and Luna Khoury, and their teacher, Yemen Rock, about an Android app they and eight other students have developed as a mobile guide for pilgrims in Nazareth. They plan to market the app, in part, by selling chocolate bars, called Nazareth Chocolate, whose wrapper will have information about the app. It will also soon be available in the Apple App Store, Rock said. Curry was in the fifth day of a Holy Week pilgrimage to the Holy Land. Previous ENS coverage of his travels can be found here. Dawani invited Curry to make a Holy Week pilgrimage through the Holy Land. In the lead photo, Hosam Naoum is on the left, not the right. A very fine priest and Dean. 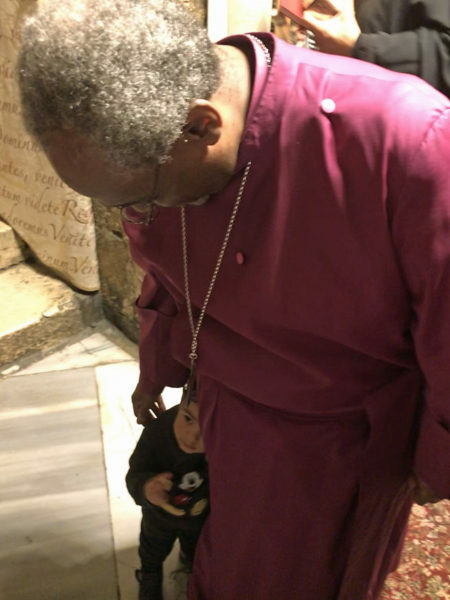 Delighted that the Presiding Bishop made this pilgrimage. The identification has been corrected, with apologies. The man on the right is Theophylaktos. Congratulations to the talented, devoted team at Jerusalem Peacebuilders for their important work. Every day in every way we see how youth can bring about positive change….